Along with the many nets and netting products we offer, we also carry many different aerators and agitators to help you oxygenate your lake, pond, livewell or transport tank. Fish of all shapes and sizes thrive in water that is properly oxygenated. We offer some of the best brands of water aerators and agitators, such as Kasco, Bait Saver, Fish Saver, Otterbine and Powerhouse. You can choose the aerator or agitator with the right horsepower for your needs, whether it's ½ horsepower, ¾ horsepower, or 1, 2, 3 or 5 horsepower. These units are capable of aerating a pond from ½ acre to 5 acres. We also offer many aeration products which will take care of your smaller needs. We offer aeration systems for buckets, livewells and tanks. The buckets or tanks can range in size from 3 gallons to 200 gallons. 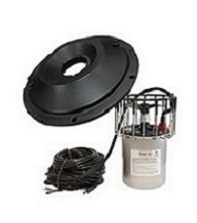 Whether you need to provide oxygen for a bucket of minnows or a lake full of game fish, Memphis Net & Twine has the perfect aerators and agitators to do the job. Place your order today!